Why I PMC? A great question and I hope my story may encourage a reluctant warrior to participate in the future. My story, like many others, is a deeply personal one that began July 19, 1970, the day my older brother David passed away at age 15 from osteosarcoma. I was only six years old at the time and he had been sick for a few years. Quite honestly, I do not have many vivid memories of him, except perhaps for a Christmas home visit or what seemed to be the numerous trips to Boston with my parents to see him, but there seemed to be a special kinship with him as I was often said to be “like Dave” (picky eater, very shy, etc.). In my childhood, I dreamt of becoming a doctor and finding a cure for cancer. Like many dreams, reality intervened and the best use of my skill set was going into business. I graduated with a degree in accounting, became a CPA and am now a successful partner in a large national CPA firm. I never stopped thinking about how I could help in the fight against cancer. In 1985 my mom was diagnosed with lung cancer and she passed away in July of 1986. So it was with them in mind that I made yearly contributions to the Jimmy Fund and was always willing to help out with that cause. In the mid-90’s I became vaguely aware of an event called the PMC and I was intrigued. It sounded like a great event and I liked riding a bike when I was a kid, so maybe I could participate. However, like my career path, this interest was interrupted by life (marriage, children, and children’s sports). In 2000 I was bold enough to get a registration ID (at the time it was necessary to have an ID before you actually signed up) but never followed through on actually registering to ride. For one summer, in 2001, I rediscovered a passion for the bike, lost some weight and decided I would sign up. But, I chickened out. It would be too hard and raising $2,900 would be too difficult. And every year when the PMC came along, I would feel guilty about letting another year go by without doing very much for the cause (just donating yearly to the Jimmy Fund). Sometimes I would get caught in the Saturday traffic near Dighton-Rehoboth (the PMC comes within 4 miles of my house) and feel even more guilty about not participating. Then, in May 2009, the wife of one of my partners passed away from cancer. I went sailing with him in August that year, just after the PMC, and in an alcohol-induced euphoria (my sober sister in law was doing much of the sailing), we both pledged to ride the 2010 PMC. I did not mention that pledge to anyone, and as January 2010 approached, I thought our commitment had disappeared like a summer tan. I had not ridden a bike since 2002 and I did not really want to start. But my partner had mentioned our pact to a few other people in the office and they cajoled me into signing up (thank you JoLynn and Marty). Friends thought I was crazy. I had put back on the weight (and then some) and was more suited for the golf course than an unforgiving bike seat. But I said ok and made the commitment for the fundraising (I was at a time in my professional life if I had to fund the then $4,200 commitment I could do it). And a funny thing happened. The first person I asked to contribute gave $200 (I had figured maybe $25 or $50 if I was lucky). What happened over the course of the next seven months amazed me. I raised $6800 and was a Heavy Hitter that first year (and I have been a top 10% since the inception of that recognition) from many generous friends, colleagues, and clients. It did not take me long to realize everyone has been impacted by cancer and is eager to help out the Jimmy Fund and that sets this event apart. As I trained the first year I started to feel connected to my brother and any pain I incurred was only a fraction of what he and my mom went through. 2010 was an absolutely great year for me to begin participating in the PMC. The crowds were, as always, incredibly enthusiastic and the weather was perfect (low 70’s, no humidity). 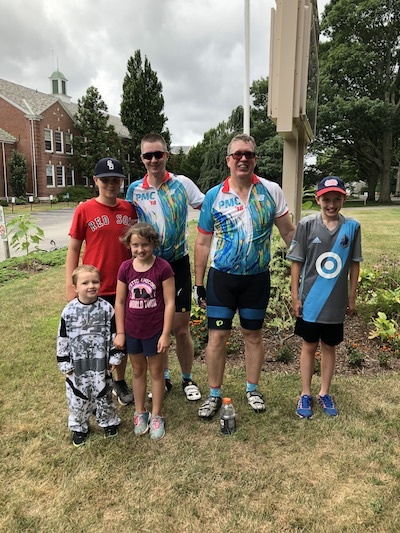 The ride for this newbie was difficult (I bike from Wellesley), but as I crested the last hill in Truro and could see the Pilgrim Monument in the distance, I thought about Dave and Mom, and the struggles they went through, and shed a tear and thanked them for getting me that far. So now you know what brought me to the PMC. So why do I continue? I think it can be summed up in Lakeville. When you ride into the water stop there you see the posters of the pedal partners. I ride for them and thousands like them. The last ten years have brought about incredible improvements to care and the next ten years promises even more! So what I thought was going to be a one-year commitment to scratch the itch of the PMC, I am now all in. My partner, alas, fell out after the first year, but I caught the fever and look forward to my 10th ride. My nephew rides from Sturbridge and my niece (an oncology nurse at Dana-Farber) and grandniece volunteer at Dighton-Rehoboth. PMC weekend has become a fixture in my life and it will remain so for a long time. Except for my marriage and children I have to say the PMC experience is one of the most fulfilling of my life. My life has been touched by cancer and I will always remember my brother Dave, my mom, relatives, and my classmates from the Somerset High School class of 1982 who have passed from cancer, family friends, and acquaintances. It is really heartbreaking how this disease touches everyone. That is why I still PMC. We are 10,000 (6,000 riders, 4,000 volunteers) ordinary people doing something extraordinary! Thank you.